After the discovery of the wreck of the Titanic in 1985, Dr. Robert D. Ballard's next goal was to find and film the wreck of the Bismarck. The search for the wreck began in July 1988, but his first expedition brought no success. A second expedition was mounted in late May 1989, and on 8 June, 1989, after combing an area of some 200 square miles, Ballard and his team finally found Bismarck's remains. The wreck lies in the bottom of the Atlantic Ocean some 470 miles west of Brest at a depth of 4,790 meters (15,700 feet). The State of the Wreck. The hull rests upright embedded in mud that covers the keel to about the level of the ship's designed waterline. Despite of the heavy shell and torpedo damage that the British inflicted on the battleship and the obvious effects of the sinking itself, the wreck is in surprisingly good condition. Few other shipwrecks are as well preserved as the Bismarck, and, except for the last 35 feet of the stern (frame 10.5) that broke away, the hull is intact. The main battery turrets dropped off the hull due to their own weight as the ship rolled over and sank, and they are now upside-down on the bottom. But the secondary battery turrets and most anti-aircraft guns are still there in their proper location. Both the forward and after conning tower, and the bridge, though heavily damaged, are with the hull, too, and the propellers are clearly visible. In the debris field that surrounds the hull, other parts of the battleship can be found such as the foremast, the mainmast, the funnel, rangefinders, etc. Considering the fact that on most parts of the decks the wooden teak planking is still conserved, and even the paint, it is most likely that the wreck will resist the effects of the corrosion for at least a few hundred years if not more. "Die Bundesrepublik Deutschland betrachtet sich als Eigentümer des ehemaligen reichseigenen Schlachtschiffes Bismarck. Tauchgänge in das Innere des Wracks sowie Bergungsversuche bedürfen der Zustimmung der Bundesregierung. Diese wird wie in anderen Fällen gesunkener Schiffe aus den Weltkriegen, bei denen mit Toten im Wrackgerechnet werden muß, grundsätzlich nicht erteilt. Die Bundesregierung fühlt sich den beim Untergang des Schiffes zu Tode gekommenen Seeleuten verpflichtet. Gemäß internationalen Gepflogenheiten sieht sie das Wrack der Bismarck als Seemannsgrab an, das entsprechend zu respektieren ist." "The Federal Republic of Germany considers itself the owner of the former sovereign Battleship Bismarck. Diving excursions to the interior of the wreck as well as recovery attempts require consent of the Federal Government. This has been categorically denied in other cases of sunken ships of the World Wars, because one must expect to find remains of the dead in the wreck. The Federal Republic feels it is its duty to protect the seamen who went to their death in the sinking of the ship. Following international customs, we view the wreck of the Bismarck as a seamen's burial site that must be accorded proper respect." Expeditions to the Wreck Site. After Dr. Robert Ballard's expedition in 1989, the wreck of the Bismarck was not visited again until the year 2001. 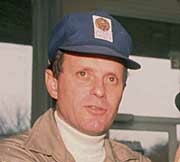 From 5-14 June 2001, an expedition was organized by Deep Ocean Expeditions (DOE) headed by Australian Michael McDowell. What was different about this one was the actual taking of people to the wreck. They reached the area aboard the 6,240-ton Russian scientific research vessel Akademik Keldysh, mother ship for two manned MIR submersibles that were used for the dives. These submersibles, which were also used for dives on the Titanic, can dive to 6,000 meters (20,000 feet) and carry three people, a pilot plus two observers. Coordinates used for locating the wreck site were from Ballard's expedition. Bismarck survivors Heinrich Kunht and Heinz Steeg were on board, accompanied by the Chairman of the Marinekameradschaft Schlachtschiff Bismarck, Dieter Heitmann. There were also two German Bismarck experts who set up a computer graphics laboratory on board. In this way the expedition had full access to plans and details of the ship. Also these experts were invaluable when it came to identifying bits and pieces of the ship in the wreckage site. The 6,240 ton Russian scientific research vessel Akademik Keldysh. Once in the site, about 380 miles south of Cork, Ireland, a memorial service was held in both German and English. Dieter Heitmann did the German remarks. They followed the German Navy protocols for a memorial at sea. Dr. Don Walsh spoke for the other navies on board: U.S., British, French, and Russian. There was also a shorter farewell ceremony when they left the site for the last time. A memorial plaque made by Blohm & Voss was placed on the wreck and photographed during the second dive day. Three television/movie teams were aboard: IMAX, National Geographic and a German group. In addition, there were two print media teams: Focus Magazine (Germany) and the The Mail on Sunday (England). Eight double (i.e., two subs down at the same time) dives were made at the site with some 24 people (including the pilots) on board. In addition to media people, there were three individual paying participants. Of course dives like this are very expensive, and only a handful of people in the world can afford such an adventure. The DOE expedition was cleared with the German government, and the site treated with reverence and respect. In no way was the wreck disturbed and nothing was taken other than photographs. 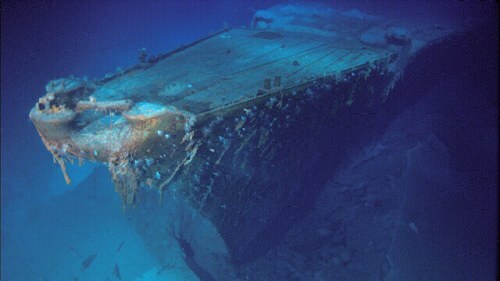 Early in July 2001, another expedition, this time headed by David L. Mearns of Blue Water Recoveries, was organized with the intent to find and film the wreck of the Mighty Hood. On their way to the site they stopped by to film the wreck of the Bismarck as well. This expedition was supported by the Royal British Legion, Commonwealth War Graves Commission, Royal Naval Association, Ministry of Defence, HMS Hood Association, and, of course, the Kameradschaft Schlachtschiff Bismarck. On board the survey ship Northern Horizon, they used the remotely operated vehicle (ROV) Magellan 725 that was connected by cable to the surface ship. The ROV mounted a side scan sonar, cameras, and powerful lights. On 9 July, the wreck was successfully filmed, and the first images were sent to the surface. A commemorative plaque, including the Roll of Honour with the full list of the names of those who died recorded onto a CD, was laid on the superstructure's wreckage. On 13 July, the expedition left the area and headed to the Denmark Strait where they discovered the wreck of the Hood on 20 July 2001. May-June 1989 Robert D. Ballard Star Hercules Using the remotely operated vehicle (ROV) Argo, Bismarck's wreck is discovered on 8 June. June 2001 Michael McDowell Akademik Keldysh First ever manned dives. Eight double dives with MIR submersibles. 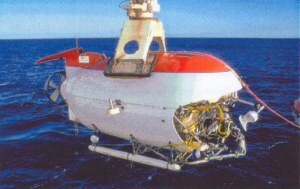 July 2001 David L. Mearns Northern Horizon Used the ROV Magellan 725. May-June 2002 James Cameron Akademik Keldysh Six double dives with MIR submersibles. July 2002 Michael McDowell Akademik Keldysh Six double dives with MIR submersibles. May-June 2005 Michael McDowell Akademik Keldysh Four double dives with MIR submersibles.